Today was FREEZING. I can’t emphasise that enough. The weather here for us down under had been very very hot during the summer and just recently, quite pleasant actually but the past few days it’s been unpleasant with high speed wind. I can’t complain, I’m bittersweet about winter and summer, I love them both the same – although I may say otherwise during those actual seasons! Haha. Anyway, since the weather has started to cool off, it’s been such a sudden transition from the ‘nice(r)’ weather into the cool weather. Today has been the coldest yet and I’m sure theres more to come but since the winter weather’s on its way, I thought i’ll put together for you some of my favourite winter looks. Keep your eyes peeled for more on the way! Also, uni starts very soon so I thought this would be a perfect post to inspire you all with ways to stay cosy when walking from building to buildings! 1. Comfy Gal – Doesn’t the whole outfit just look warm and cosy?! The kimono style jacket is perfect for winter and keeps you warm and cosy. 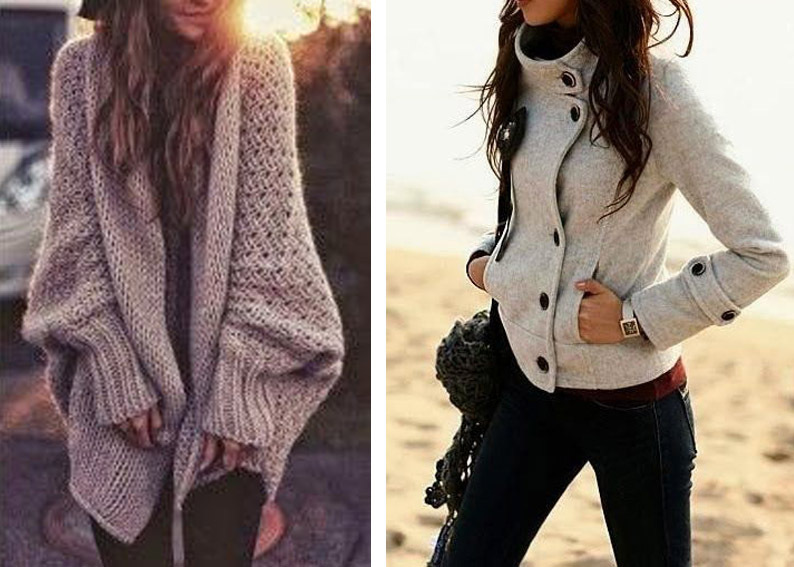 Paired with some leggings or jeans and topped off with boots, you can’t go wrong! What a classy yet comforting look. 2. Sophistication – I’m not sure why but the idea of a tight formal jacket, paired with tight leggings or jeans say ‘I actually didn’t spend any time putting this together but it looks like i did’. Classy! 3. It took time to put this together, (not) – Yes, not really winter per say but for the autumn time or those windy days, this is perfect. The long sleeved top will keep you warm, while paired with the skirt, it won’t make you feel too hot. After all, it says helloooo classy! 4. Comfy yet classy – Does this look say stylish or what! I love pairing a tight mini skirt with an oversized knit with stockings and boots and even an oversized scarf if it’s THAT cold!